Get to the Point! Boxwood Joggers Yeah! 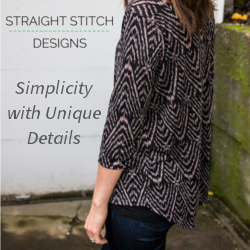 In getting ready for colder weather (yeah, like still a few months away, but, sewing. ), I noticed my sewing list has pants for pretty much both girls and myself. I really like the fit and ease of leggings for my girls, but I really wanted to find a fun pattern for a heavier knit fabric that would be suitable for colder weather. Then Sew Like My Mom was hosting a pattern test for her new unisex Boxwood Joggers pattern (awesome timing! ), so I thought what a perfect opportunity to make some pants for my big girl. The fabric recommendation for these pants are french terry. If you’ve never sewn with french terry YOU SHOULD! It’s very easy to sew with, has a towel (loop) type texture to the wrong side, and it comes in a variety of weights. I made pants in a lightweight and capris in a heavyweight french terry (FT). 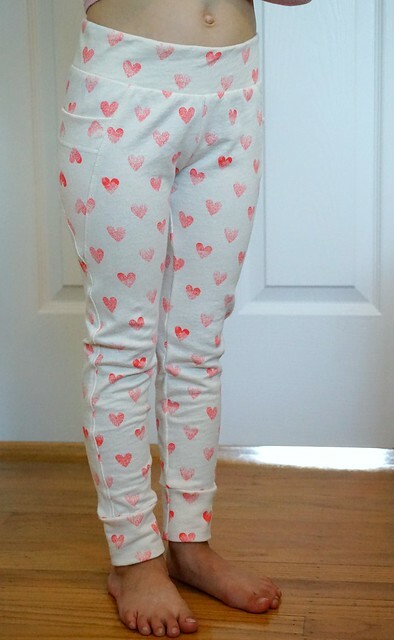 When sewing up the pants in size 3 I decided to use this lightweight hearts FT which has a lot of stretch. I found it at JoAnn’s in the kids fabric section. This FT is perfect for fall, when it’s not really too cold out, at least here where we live. I did topstitch the pant’s pockets and side seams though to make sure everything stayed put after pressing. I just used a ball point needle and a longer stitch on my sewing machine for that. My girl decided she wanted the hearts on the pockets to be upside down. She’s full of opinions now! I finished up the pants pretty quickly, and we just love them! They fit her perfectly, maybe too perfectly, but there’s some stretch here so she’ll have a little room to grow. Geez, don’t look at those dirty feet though! 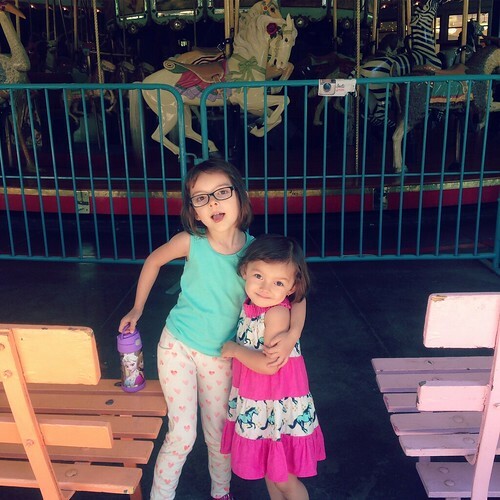 Goodness, my girls run around everywhere without shoes…take after their mama! As for the striped version, we decided to make them a capris, hoping that this would alleviate the feeling of the FT on her calves. They were more comfortable and she was able to put them on for pics, but they didn’t have enough stretch for the pattern. I’ll be putting these away for little sis! I know I’ll be getting more FT and making some for myself as well! I can squeeze myself into a size 14 or 16 I think, or at least I’m gonna try!!! 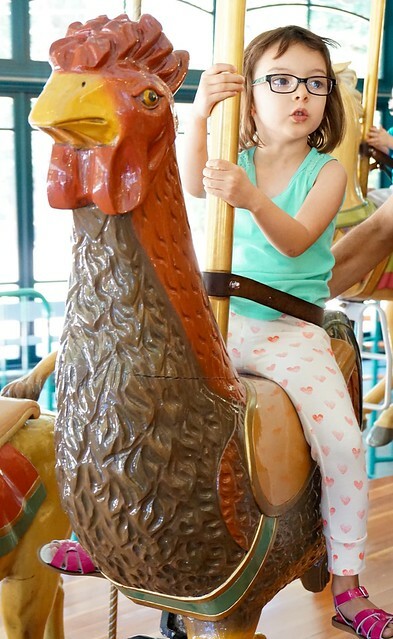 She wore her pants out the other day when we were at Tilden Park, and they really don’t look like handmade pants at all. The lines the pockets give these pants are just perfect, and the fit is spot on. We had several compliments on them too, so I’ll take that as a win! The Boxwood Joggers pattern was just released today too, and they’re on sale. Woohoo! I believe they’re $10 for the bundle (all sizes) or $6 for each pattern (sizes 12 months-8years or 6-16 years). 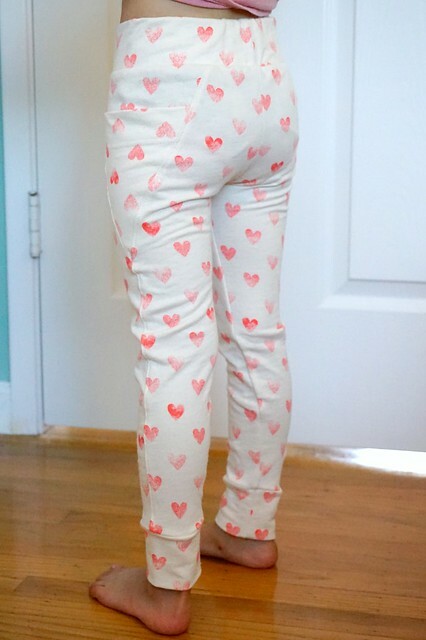 If you can fit into the larger teen sizes, then get the bundle, because let me tell you, these are super cute pants, and you’ll want some after watching your cute little girls running around in them. Heehee! Who else likes being matchy matchy? Yes! They’re all so cute! These are so cute! I love that triangle pocket, really unusual. Thanks! I thought the same thing too, the pocket makes it look so different.